Coming into the Sandy Mush valley from Asheville is a little like stepping back in time, says Ariel Dixon of the Buncombe County Soil and Water Conservation District. The fields stretch long and wide, dotted with grazing cattle and produce crops, and the farmhouses and barns look settled into the land. 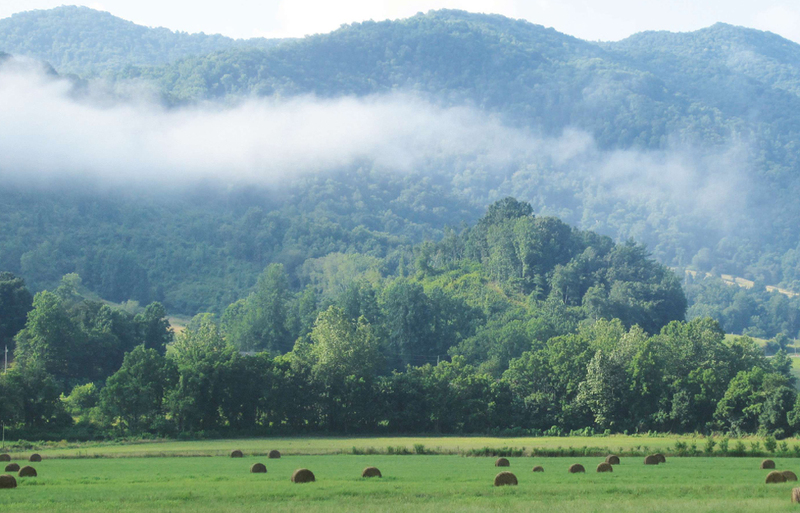 This part of North Buncombe has the highest concentration of preserved farms in the county, and as a result, has some of the most undisturbed scenic vistas. Those views are part of what Dixon hopes will draw visitors to the Farm Heritage Trail that launched in April. The trail is a driving and cycling route through Alexander, Leicester, Newfound, and Sandy Mush, with marked stops along the way, including Addison Farms Vineyards and Carolina Bison. Trail organizers created maps for cyclists and motorists and a scavenger hunt for families and school kids, available on the trail website. Throughout the year, farms will host hikes, farm-to-table dinners, demonstrations, and more. Upcoming special events on the Farm Heritage Trail include guided hikes at Long Branch Environmental Education Center July 9 & 10 that will focus on edible landscaping with wild and medicinal plants, and an Addison Farms Vineyards stop on the August 20 & 21 Leicester Studio Tour. For more, see www.farmheritagetrail.org.